They aren't the few and the proud because it's easy, and We, The Marines honors that arduous path. We see new recruits arriving at Parris Island in the wee hours of the morning, with the drill instructors tearing into them before they've so much as stepped foot off the bus. They're crammed into a small concrete room that's flooded with a noxious gas. The most challenging 12 weeks of their lives culminate in The Crucible: a 54 hour ordeal spanning 48 miles, 45 lbs. of gear to lug around, and with 6 hours of sleep and rations for 2 meals all the while. We're also shown that the Quigley obstacle course to which officers in Quantico are subjected isn't all that much more pleasant. Much as the forging of a sword demands sweltering temperatures, strength, patience, focus, and a hell of a lot of hammering, so too is the forging of a Marine grueling by necessity. That's deeply felt in an emotional graduation ceremony. Even with months of basic training condensed to a few short minutes on-screen, it's impossible not to feel a tremendous sense of pride in what these newly-inducted Marines have accomplished. A fixture at the National Museum of the Marine Corps' Medal of Honor Theater since its inception last year, the 38 minute documentary We, The Marines explores the USMC by weaving together its storied history with present-day challenges and training exercises across the country. Archival footage in Korea, for instance, leads into the training for cold weather operations in Bridgeport. The role of four-legged Marines in Vietnam transitions into an explanation of the key role that dogs continue to play in the Corps, ferreting out explosive devices more effectively than the most bleeding-edge technology. 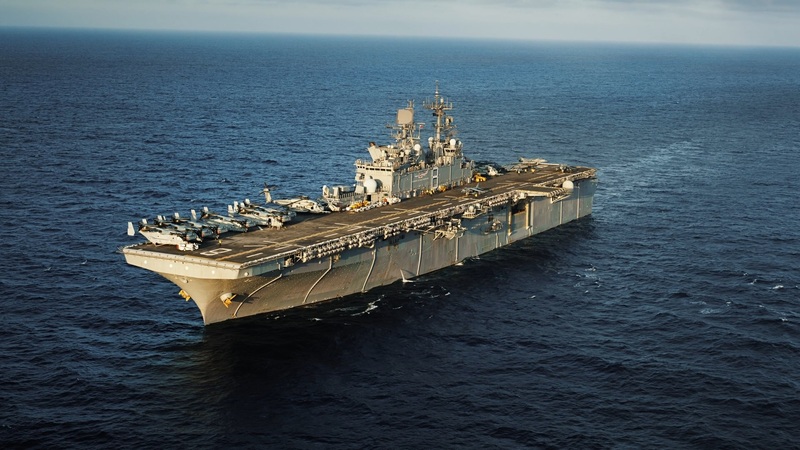 We, The Marines does rightly marvel at the array of hardware empowering the Corps to deploy and retrieve both man and machine, from a nearly 88 foot long LCAC hovercraft to the staggering Osprey V22 that doubles as both helicopter and turboprop aircraft. We're treated to the delicate art of mid-air refueling. 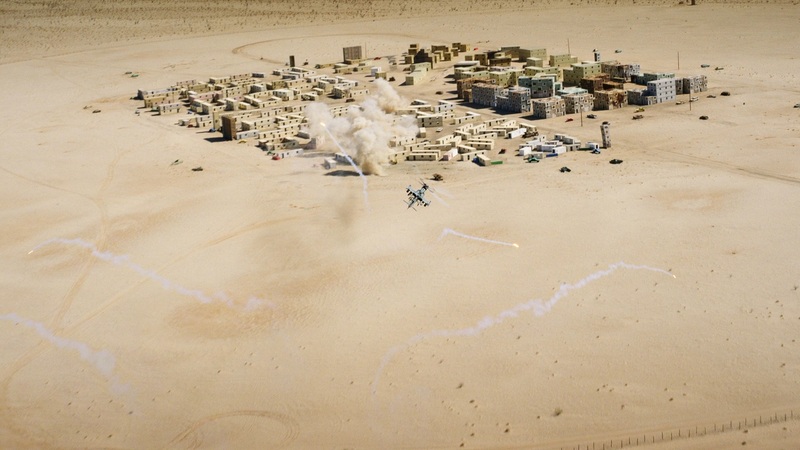 We see a helicopter pilot training in an Arizona desert, launching rockets at a facsimile of a Middle Eastern city. 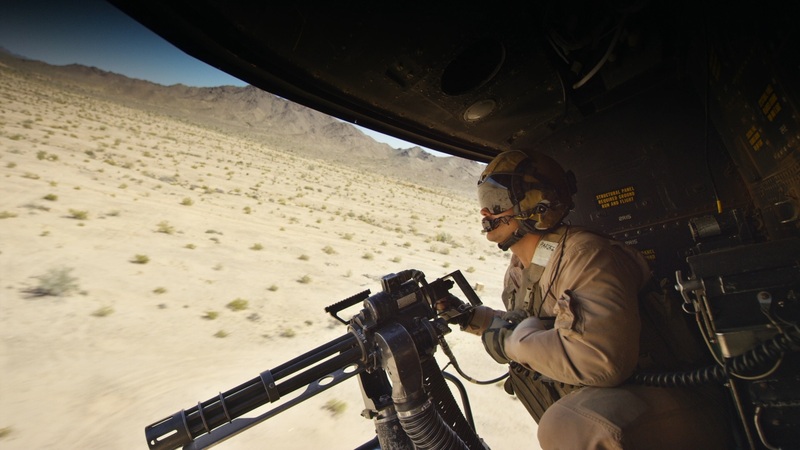 The training these Marines continually undergo is so thorough that they must even learn how to escape from a submerged helicopter – upside-down and blindfolded. The documentary also explores how the nature of warfare has changed, as keeping the peace is not necessarily always about a display of force. We, The Marines touches on the critical roles the Marines played in dealing with catastrophes in Japan, Haiti, and Nepal as well. 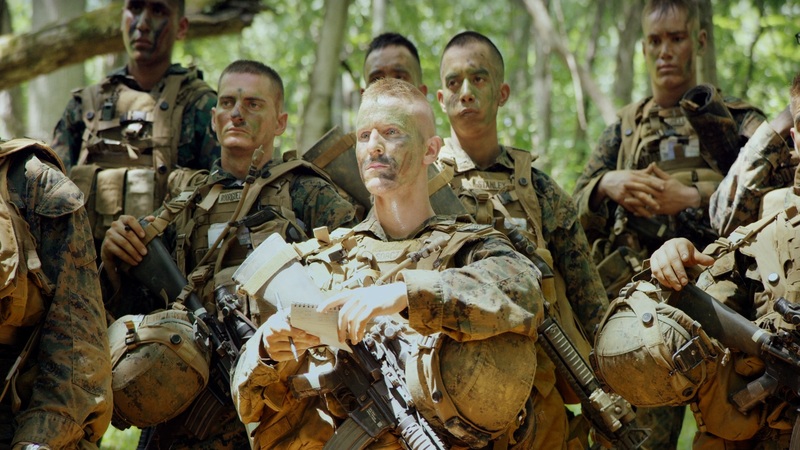 Though a thorough study of the USMC could easily encompass a documentary many hours in length, We, The Marines covers a startling amount of ground in its lean 38 minute runtime. 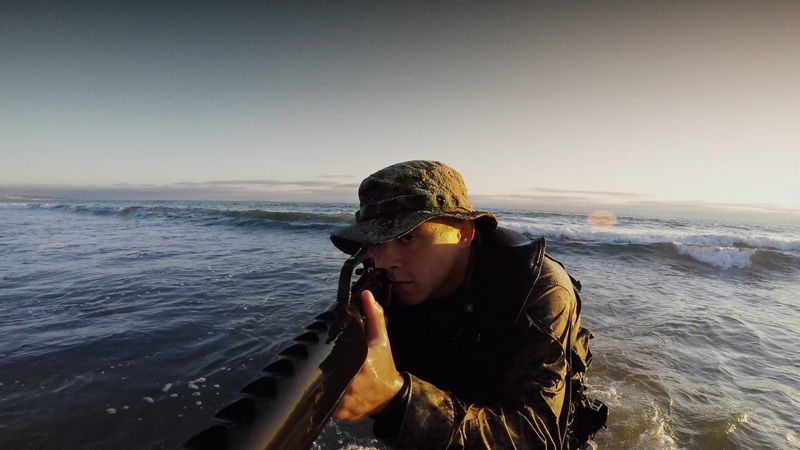 Produced in association with the Marine Corps Heritage Foundation, the filmmakers have been granted remarkable access and capture some truly incredible images along the way. The cinematography is stunning, and the storytelling is tight and well-constructed – no small feat, bounding across so many states and so many eras of military history. It benefits greatly as well from the narration by Gene Hackman, a former Marine himself and one of his rare contributions since retiring nearly fifteen years ago. We, The Marines celebrates and honors the Marine Corps without feeling like a glorified recruitment film. If anything, the message is quite the opposite: that you, the viewer, are almost certainly not capable of what these exceptional men and women have accomplished. Having watched We, the Marines, I walk away with an even greater respect, admiration, and understanding for what makes the USMC what it is. Highly Recommended. We, The Marines leads the first wave of HDR10+ titles on Ultra HD Blu-ray: Samsung's royalty-free alternative to Dolby Vision's dynamic HDR metadata. I'll confess that nothing in my chain supports HDR10+ – it's not as if my LG OLED is going to get a firmware update anytime soon to support a Samsung-spearheaded initiative – so I can't speak to what kind of an improvement it offers here. But no matter what kind of Ultra HD display you happen to have, We, The Marines readily supports it. There is a separate SDR presentation for those who bought into 4K before HDR had established a foothold. The other falls back to HDR10 if your home theater isn't ready for HDR10+ quite yet, and despite not having that granular level of frame-specific metadata, the end result is still nothing short of dazzling. At any given point throughout We, The Marines, you could press 'Pause' and be looking at an image worth hanging on the wall. The cinematography is surreally gorgeous from its first frame to the last, delivering some of the most spectacular UHD imagery I've come across. Dazzlingly detailed and sharp to a gleaming edge, there's no mistaking that We, The Marines is a native 4K presentation. Its HEVC encode remains robust even during some exceptionally challenging moments, such as the violently swirling grass below an Osprey as it prepares to touch down. Its colors are bright and impactful, most memorably the brilliant whites of the iconic Dress Blues. 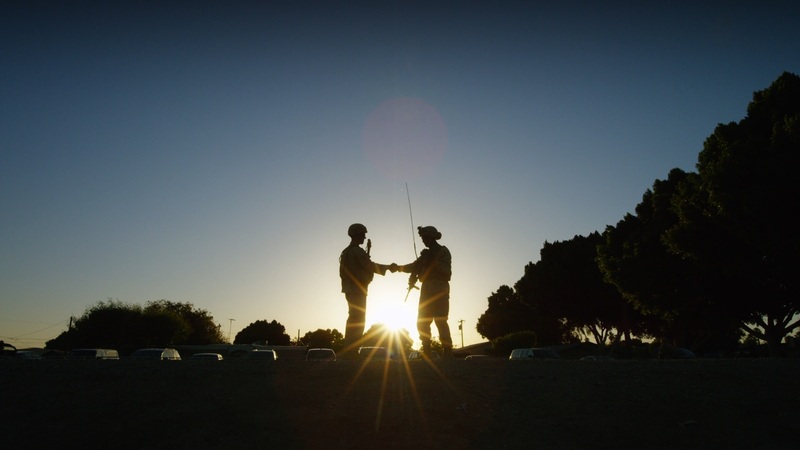 We, The Marines never squanders an opportunity to film during the golden hour. It's fascinated by placing shadowy figures in the foreground against explosive bursts of light from the setting sun, making for some of the most striking use of HDR I've yet witnessed on Ultra HD Blu-ray. Without hesitation, We, The Marines is one of the first discs I'd grab off the shelf to show friends and family what this format is capable of, and all the better that there's so much more to recommend about this documentary beyond its stunning visuals. We, The Marines is presented at a screen-filling aspect ratio of 1.78:1. The Ultra HD Blu-ray release arrives on a BD-66 disc, while its 1080p counterpart is served up on a single-layer platter. 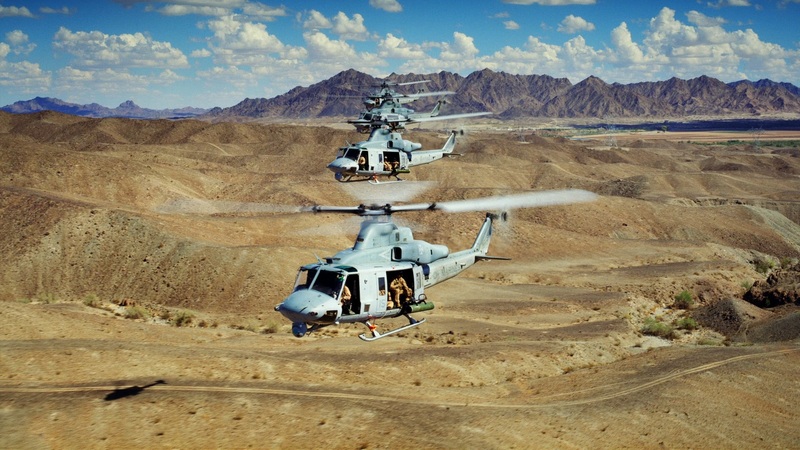 We, The Marines' Dolby Atmos audio aims to place the audience squarely in the middle of the action, whether it's the roaring applause during a graduation ceremony, chirping crickets as cadets arrive at boot camp in the dead of night, howling mountain winds while training in the bitter Nevada cold, inescapable aerial bombardments during WWI, or water flooding into a submerged 'helicopter'. Every element in the mix is clear and distinct. Bass response is appropriately thunderous. I found myself repeatedly awestruck by the attention paid to directionality and movement from one channel to the next: jets launching from an aircraft carrier, the soaring choral voices in Logan Jones' cover of "The World's Greatest", the roar of helicopter blades overhead, and the distinct placement of rifle shots in a field and the sounds of spent shells spilling onto the ground, to name just a few. Also included is a DTS-HD Master Audio 5.1 track, as well as optional English (SDH) subtitles. The audio options for the traditional Blu-ray disc are similar. It too features Atmos audio, along with a lossy Dolby Digital 5.1 track (640kbps) and optional English subs. Addendum (22 min. 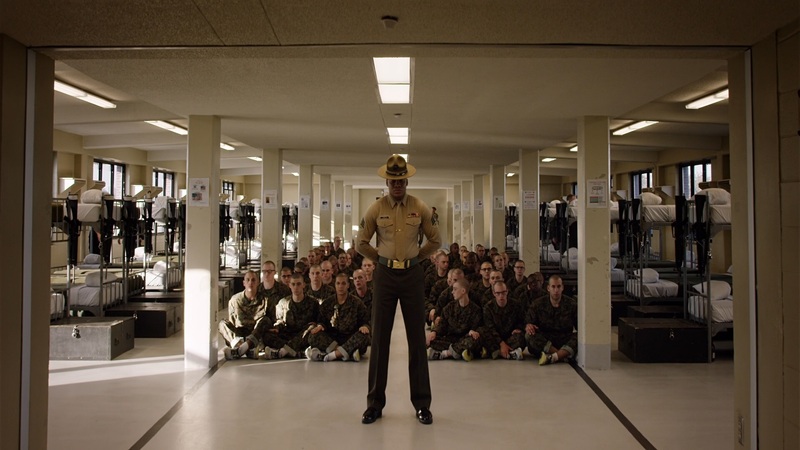 ; HD): Rather than offer individual reels of deleted scenes, extended sequences, interviews, and behind the scenes footage, We, The Marines compiles them into a single feature. It's a more effective approach than I would've assumed, feeling very much like a film in its own right rather than a parade of extras. Among what's featured here are the cadets' scripted First Phone Call home, a lengthier look at mid-air refueling, additional drill instruction, and a discussion about the necessity of humor in the Corps. 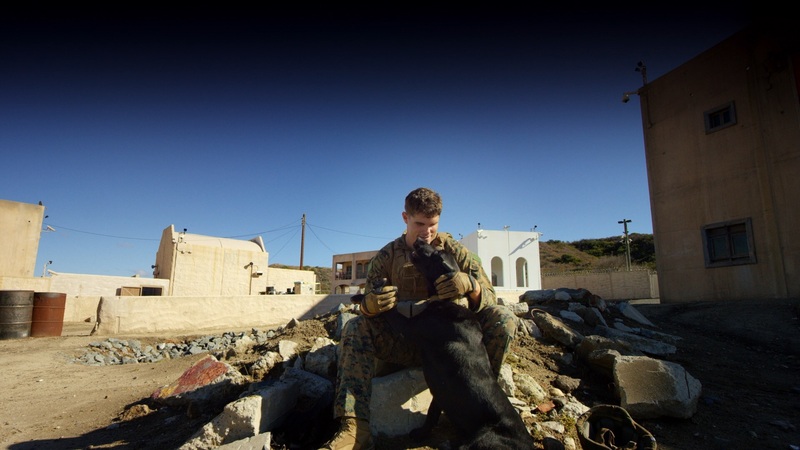 There are several on-camera interviews with Marines, as well as extensive behind the scenes footage and commentary by field producer/cinematographer Robert Walker. We learn, for instance, that the waters of the notorious Quigley obstacle course at Quantico had frozen over at one point during production. This addendum is a very worthy companion to We, The Marines and near-essential viewing for anyone picking up this disc. Trailer (2 min. ; UHD / SDR): The trailer for We, The Marines is presented in 2160p, though without HDR. Additional 4K Trailers (13 min. ; UHD / SDR): Also included in Ultra HD are trailers for Flight of the Butterflies, Humpback Whales, Journey to Space, The Last Reef, Rocky Mountain Express, Wonders of the Arctic, Dream Big, and National Parks Adventure. A digital copy code for a direct download is included as well. As of this writing, the redemption website doesn't work, continuing to load a GoDaddy 'parked domain' page even nearly two weeks after release. We, The Marines comes packaged with a slipcover. 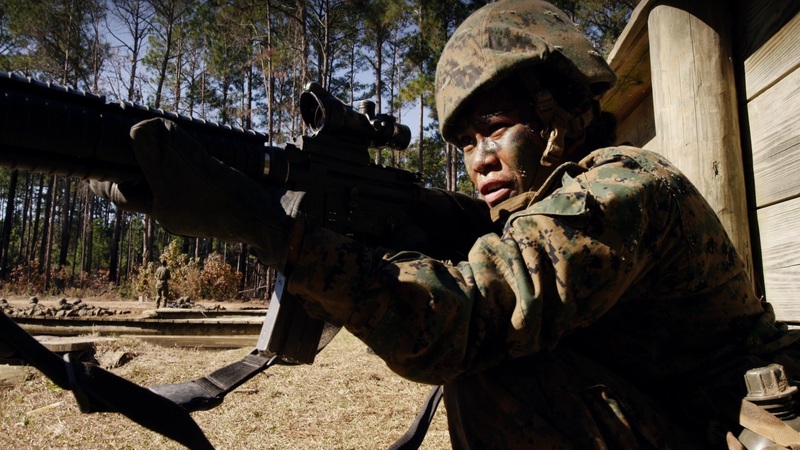 We, The Marines honors the past, present, and – through the new recruits we meet here – the future of the USMC. In the space of its swift 38 minute runtime, it explores the grueling training necessary to forge a Marine, marveling as much at these brave men and women as the documentary does at such mighty hardware as the Osprey and colossal LCAC. This artful and compelling overview into the Marine Corps would come enthusiastically recommended in any event. Heightened further by its immersive audio and world-class visual presentation, this Ultra HD Blu-ray release makes We, The Marines that much more irresistible. Highly Recommended.